Ten-year-old twins Joe and Jemima Lancelot have no idea why their parents have disappeared, but a mysterious old book which had belonged to their father holds the answer… and so begins an unusual quest to discover the truth. Together with Max, their remarkable Tonkinese cat, and Charlie from next door, the children embark on an epic adventure, travelling back in time to the lost city of Atlantis. Once there, however, they soon run into problems. Can they save the people of Atlantis from the disaster which is about to destroy their land forever? And will they find their way back to the safety of their own time before it’s too late? I had initially wanted DinoBoy to read the book and do a simple review but the schedule clashes with his school exams. He did read the Prologue & Chapter 1 while waiting for the bus on a couple mornings, he would love to continue reading it during our nightly Reading Time but he has to leave it till after his exam at the end of this month. Thus, this Mama has the honour of reading and reviewing the book. The story started off with Max, the cat witnessing the mysterious disappearance of the twins Joe & Jemima's parents. The twins & Max went off to stay with their Uncle Richard, a professor of archaeology at a university and his housekeeper Mrs Garland. On one morning, together with their friend Charlie, the kids went up to the attic to look at "that book of Mum's and Dad's" which leads them to start their exciting adventure in a strange land, making new friends and their plan to warn the Atlantans about a dreadful disaster that is going to happen in near future. The storyline is simple but there is a fair degree of suspense in the plot which will gripe the young readers' attention. I felt anxious and angry with the evil high priest who, together with his lackeys tried to harm the kids and Max. I love Max the cat, in fact when I first saw him on the front cover I was immediately drawn to the book, he looks like he is going to say something clever any moment. Max is like an adult in the story, giving the kids some suggestions or solutions when the kids are stuck or not sure what is the next step they should do. There is another cat in the story, Mia the temple cat, who came out for a brief moment at the later part of the story. I am not sure the purpose of this character other then helping Max rescue the kids. Perhaps she will reappear in the other series? I enjoyed this book a lot and can't wait for DinoBoy to continue reading the book, I am sure he will love it as much I did. Parents or teachers may like to do a unit study about the lost city of Atlantis or about Greek mythology since Wendy mentioned a couple of Greek God in her story; Poseidon & Zeus. I am sure the children will enjoy the activities and be thrilled in studying and know more about the mysterious Atlantis & mythology. Even though the recommended age for this book is 8 years old, I feel that if your child is an advance reader like DinoBoy they will enjoy the book too. Dividing my time between homes in England and South-West France, I live with my husband Simon and our two beautiful Tonkinese cats. I spent 20 years as a teacher of French, Latin and Classical studies, but now write books for children instead of teaching them. 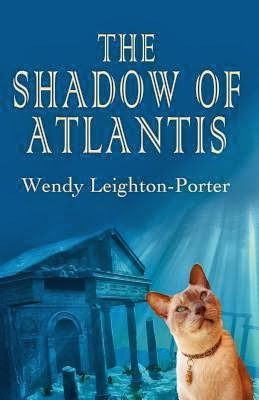 The Shadow of Atlantis is the first book in a series of 15 planned time-travel stories, featuring 3 children and, unsurprisingly, a rather special Tonkinese cat. Having recently completed number #7, The Shadow of the Norman Arrow (coming soon! ), I’m currently working on the eighth book in the series. 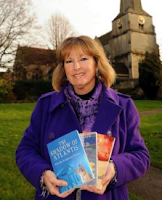 As I take my young readers on a magical mystery tour through the past, I’m also hoping that my love of history, myth and legend will rub off on them too. Personally, I’m enjoying the journey so much, I don’t ever want it to end! Why not come along with me for the ride? Terms and Conditions: NO PURCHASE NECESSARY TO ENTER OR WIN. VOID WHERE PROHIBITED BY LAW. A winner will be randomly drawn through the Rafflecopter widget and will be contacted by email within 48 hours after the giveaway ends. The winner will then have 72 hours to respond. If the winner does not respond within 72 hours, a new draw will take place for a new winner. Odds of winning will vary depending on the number of eligible entries received. This contest is in no way sponsored, endorsed or administered by, or associated with Facebook. This giveaway is sponsored by author Paul Hewlett and is hosted and managed by Renee from Mother Daughter Book Reviews. If you have any additional questions - feel free to send and email to Renee(at)MotherDaughterBookReviews(dot)com. Disclaimer: I received a free pdf copy of this book in exchange for my open and honest review about the book. The opinions expressed here are 100% my own. Thank you for hosting me on your blog. I'm so glad you enjoyed the story and hope you get the chance to read some more in the series. Max was particularly pleased to hear how much you liked him - he thinks you have impeccable taste!